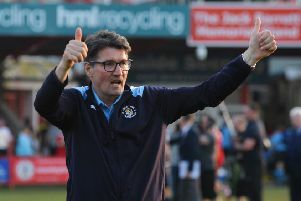 Luton boss Mick Harford knows full well he has the depth of squad available to make change for this evening’s clash at Bradford City if he sees fit. The Hatters made the lengthy trip to Valley Parade yesterday afternoon, just days after travelling all the way down at back from Plymouth Argyle for a goalless draw on Saturday. With another game on the horizon at the weekend, it gives Harford food for thought over any alterations he might make to ensure his side are raring to go, saying “If we need to (we can make changes) and that’s why we put the squad together for that reason. “When these games, the midweek games come along and Saturday, Tuesday, it’s difficult, it’s physically hard for the players, so we have a good squad to choose from. We’ll see, the boys are very diligent in their preparation and the way the work, so we’ll have a good look at it and then pick a team after we’ve trained and see where we are. Harford also admitted that the poor playing surface at Bradford could come into consideration, as he continued: “It does, I watched the game yesterday when they beat Peterborough, there was a bit of green grass on there but it looked a bit bobbly. The Bantams go into the game under new management, with former Blackpool and Blackburn boss Gary Bowyer at the helm taking over from David Hopkin last week. He got off to a fine start in his opening game, beating Peterborough 3-1 on Saturday, as Harford said: “Gary’s done a good job wherever he’s been. “He went in there, changed the shape of the team and it looks like they’re playing with a bit of freedom. “They’ve got some good players, I believe they’re in a false position too. “They played a certain shape on Saturday, I’m not sure what they’ll do, but he’s gone in there, got a great result against Peterborough, so they’re a threat. Although City picked up a crucial three points in Bowyer’s first game in charge, they are still in real relegation trouble, four points adrift of safety with 10 games to go. Harford added: “I’ve no idea what’s gone on there, we did beat them here comfortably (4-0), but they’ve got (Jack) Payne on loan from a Premier League side (Huddersfield), they’ve got decent players. “(Jacob) Butterfield from Derby who apparently played very well at the weekend and was their main man, so they’ve got a good squad, the likes of (Eoin) Doyle who are seasoned pros and know their jobs, know their roles. “It’s a big club, ex-Premier League club and they’re well supported. “They’ll be coming in to play and it’s a challenge for them to play Luton.